Our group has developed the TmTools routines, which has served as the interface between the Simulators (GASS and GIBIS simulators of CU2) and the data processing systems (starting with CU1 Mission Operations Centre Interface Task, MIT, and CU3 Initial Data Treatment, IDT). During operations, the TmTools routines is used for the decoding of the raw telemetry from the satellite. Additionally, our group participates in the Configuration Control Board (CCB) for the definition of data model of the Main Database (for the CU2 and CU3 sections). The task of CU3 is to organise and implement the data processing chain all the way from receiving Gaia’s raw telemetry down to the core astrometric solution. Thanks to a known experience and deep knowledge of the mission, our group is in charge, from the beginning of DPAC, of the design and most of the implementation of IDT and IDU. More information at CU3:: Core Processing. ESA issued an Announcement of Opportunity for the design, implementation and operation of the Gaia archive, delegated by ESA to the scientific community through a new CU9. A consortium led by X. Luri was formally appointed by ESA for this task in Feb 2013. More relevant if we consider that Gaia has no instrument PIs. 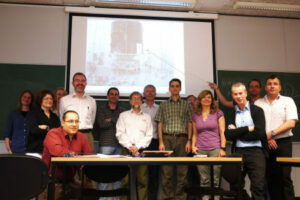 This great success has also allowed us to lead an FP7 project GENIUS devoted to CU9 tasks. 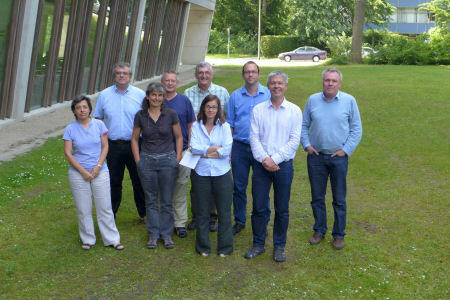 Several members of our team belongs to some inter-coordination unit working groups, created to study specific problems of the mission: the Radiation Task Force (RTF) to study the way the effects of radiation damage may be corrected in the Gaia data processing, and to coordinate measures to do so between the different CUs; the Calibration Task Force (CTF) group which is in charge of the definition for the calibration activities; and the Offset Instability Task Force (OITF) to deal with issues surrounding the PEM-CCD offset instability. The role of the Gaia Science Team (GST) is to advise ESA, through the Project Scientist, on all top-level science performance, science policy and science organisation aspects of the mission. Carme Jordi is member of GST.